The Indie Publishing movement of the past half-dozen years has changed the course of the publishing industry. Publishing books have become a lot easier thanks to eBooks, Amazon, and other Print-on-Demand (POD) publishers. Would-be-novelists (like myself) that have tried to break into Traditional publishing have finally found an avenue to get their works out to readers that had not existed before. As a result, there are quite a few guides on how to become a successful Indie Published Author. Of course, most writers are looking for the book or books that has the magic formula on how we can get lots of readers each time we publish a book and become rich as well. 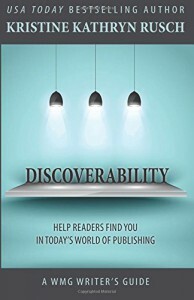 Discoverability: Help Readers Find You In Today’s World Of Publishing by Kristine Kathryn Rusch will not give you the magic formula that writers want for a broad readership and enormous wealth. However, Rusch’s four decades of a being writer (Science-Fiction, Fantasy, Mystery, and Romance), editor, and publisher dispenses sage advice on how an author can actually make a living in the Indie Publishing Industry. This book began as a series of blog posts from the Business Rusch column on her website. Rusch decided to expand these blog posts into book format and updated some material that reflects the constant changes in the ever-evolving Indie Publishing movement. She covered a wide range of topics that ranged from how things were done (and are still done) in traditional publishing, how to gain trust with readers, and how to have a business mindset as an author. Rusch included her own experiences over the years that gave Discoverability a much-needed perspective amongst all the other how-to guides out there. Rusch reminded me in that quote why I became an avid-reader and now a published writer. That quote was worth the price of the book. Discoverability gets my highest recommendation and a must read for writers who want to develop a career and make a living in the Indie Publishing industry.